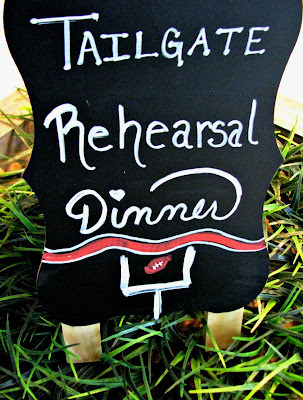 Football season is here, and I just love football tailgate themed parties. That's why I was excited when my mom asked me to decorate for my little brother's rehearsal dinner a couple of years ago. He and his wife are big UGA fans and love tailgating at the Georgia Bulldog football games. So, they requested that we create a football tailgate themed wedding rehearsal.